By administrator in IMC Exploration Group (IMCP) on 14th December 2015 . Gold Frenzy, the story of Wicklow’s gold – An excerpt from the book by Dr Peadar McArdle. 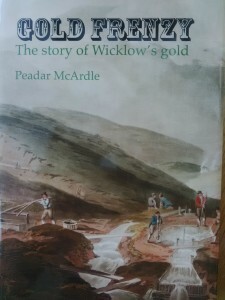 Dr McArdle, who recently retired as Director of the Geological Survey of Ireland, has had a long term interest in the history and origin of the Goldmine River gold deposits. Text copyright Dr Peadar McArdle 2011. Notwithstanding Weaver’s failure to secure funding for the tunnel, he did open 12.8km of trenches down to bedrock, quite an extensive undertaking. The depth of overburden gradually thins upwards towards along the valley slope and at the point where it almost disappears in Ballinvalley (upslope from the Red Hole) and adit was driven into the mountain, but only for 320m. Additional adits and shafts were also opened in the district. The evidence of all these workings still remain in the valley and the occasional radial trench forms the basis of its modern drainage. However it was all to no avail. None of the quartz veins had any gold particles, despite thorough sampling and rigorous chemical analysis, and this suggested there was no local source for the alluvial gold. Weaver’s efforts were terminated in 1803, with another 12kg of gold recovered since 1800, but the military barracks remained occupied with a party of troops for some years afterwards just in case the neighbours were distracted once more. In 1819 Weaver summarised the outcome of Government operations from 1796 to 1803. A total of just over 944 ounces of gold was recovered. Just 6.3 percent (almost 59 ounces) was sold as specimens at £4 per ounce, melted and cast into ingots by Weaver. The vast bulk, 93.7 percent, or 885 ounces, was sold to the Bank of Ireland, but at a slight premium. Weaver notes that there was a loss of 4.25 percent gold in the process. The total aggregate value of native and ingot gold was over £3,675. Eminent scientist Richard Kirwan claimed that little or no gold is replenished by modern stream action. He considered that, even where replenishment was taking place, based on eighteenth century European experience, it would be limited to minor quantities of tiny flakes. Accordingly he considered it could “be advantageous to none but the poorest people.” It is unusual for persons to be disdainful of small amounts when they relate to commodities such as gold and in this attitude I suspect that Kirwan was quite different from the neighbours. So a dichotomy of views arose and surprisingly would persist to modern times. On the one hand, officialdom saw no potential for a viable operation in Wicklow and, anyway, would not countenance investing taxpayers’ money in a speculative venture involving gold. 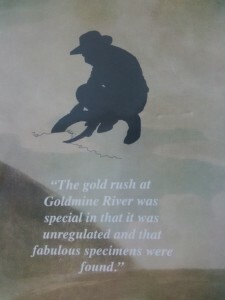 Feelings towards Goldmine River in Dublin or London would always be ambivalent. On the other hand, local residents and prospectors did not share these opinions. They were not appalled by unruly assemblies and workings, nor were they discouraged by the risk of poor returns. So the interweaving of these opposing views would form the historical tapestry for these gold workings.